In April, The Daily Californian named “Baby Driver” its most anticipated film of the summer, beating out releases by cinematic titans such as Christopher Nolan and Sofia Coppola. Leave it to director Edgar Wright to meet those expectations, then zoom past them all. His latest film is his finest, a guaranteed staple in any Best of the Year list. After opening with a car chase that would make George Miller jealous, we see the title character, Baby (Ansel Elgort) become entangled in a classic “one last job.” But his exit from crime is complicated as he falls for Debora (Lily James), whose taste in music makes him swoon. 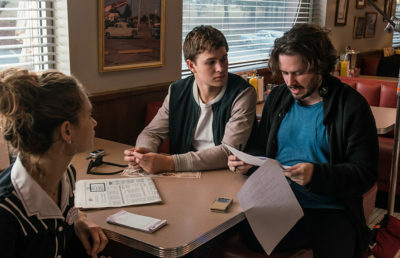 Much of the film is contingent on their romance, and Elgort and James deserve credit for an instantly believable connection. Elgort’s dialogue is sparse, so he has to emote with facial expressions and body language throughout the film. He pulls it off stunningly, all this despite having sunglasses frequently obscure his eyes. As Debora, James excels at representing all the qualities that Baby wishes he could embody, but can’t because of his career in crime. These two knockout performances result in a romance to root for, lending the film its undeniable sense of heart. It wouldn’t be an Edgar Wright film without a powerhouse ensemble cast, and “Baby Driver” is no different. As a crime boss, Kevin Spacey washes the taste of last year’s abysmal “Nine Lives” out of our mouths. He is the ultimate steely badass, and “Baby Driver” only further cements that status. 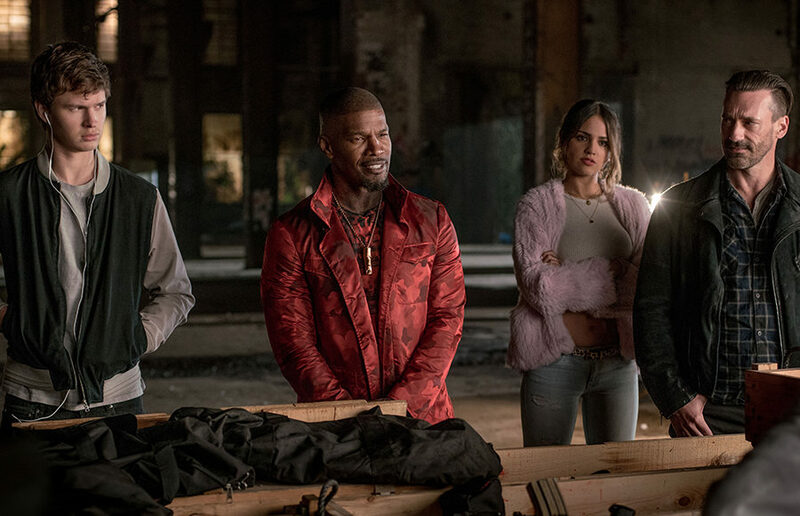 Jon Hamm, Eiza González and Jamie Foxx round out Spacey’s gang of robbers, and each is likable enough to make us forget that they’d kill in a heartbeat. 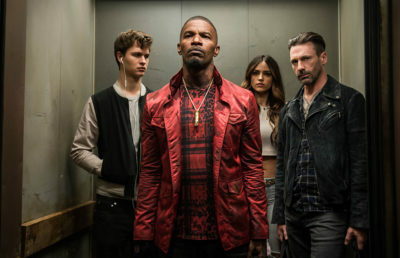 Much has already been said about the film’s soundtrack, but no discussion of “Baby Driver” would be complete without acknowledging how its precise curation and narrative purpose places the film on a completely different plane from its contemporaries — this film blows “Guardians of the Galaxy,” with its excellent thematic utilization of classic rock hits, straight out of the water. Baby knows songs we don’t — he’s a human incarnation of Spotify, which quells his tinnitus — and we’re happy to let him take the aux cord. “Baby Driver” is an infectious joyride because of its stellar performances and standout soundtrack, but ultimately, the film is a triumph for what it represents. This may be Wright’s sixth feature, but it feels fresh. For a filmmaker notorious for his style — crash zooms, quick cuts and wipe pans among them — Wright reigns in the directorial flourishes that put him on the map. While his unique style is present in “Baby Driver,” it has matured and evolved, allowing rich, complex characters to speak louder than any camera trick. Wright’s deft direction also lends the film’s action an ebullience rare in genre filmmaking today. 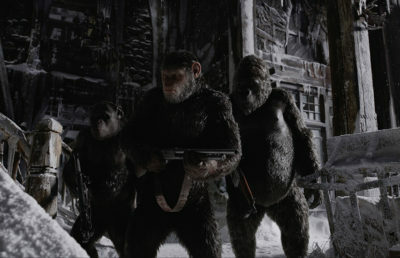 He incorporates sets, practical effects and clear character motivations to create scenes that pulse with tension. On a peripheral level, these chase scenes are simple — no submarine bursts from an ice floe as in “The Fate of the Furious.” In Wright’s hands, such superfluity would just get in the way. As the film’s tagline goes, all he needs is one killer track (and several stunt vehicles to destroy along the way). “Baby Driver” further separates itself from the crowd through its non-espousal of the heists it portrays. Even though Baby tries to make the most moral decisions at any given moment, the circumstances don’t always allow for ideal repercussions. Wright isn’t afraid to examine the very real, and sometimes heartbreaking, consequences of crime. Ultimately, though, Wright never lets “Baby Driver” simmer in dourness, and the film affirms the cliche that no good deed goes unpunished. This is a film that wants to believe in the inherent goodness within people, even criminals. It might be a film about crime, but audiences will feel inspired to do good, no matter what the cost. And maybe to drive home from the theater a little faster than normal. Harrison Tunggal covers film. Contact him at [email protected].